Our summer and now autumn drink of choice has hands-down been the pomegranate & elderflower fizz. It's simple, easy and so satisfying on a hot day or after work to take the edge off. I have yet to experiment with other flavours because we've become so obsessed with this one, but I'm sure the lime & coconut or a mango flavour would be delicious. I think these drinks are also known as Italian sodas but I prefer the word fizz. All you need is two ingredients: San Pellegrino or any other fizzy water and Pomegranate & Elderflower cordial. I prefer the Bottle Green brand because it's easy to get from Waitrose, but I'm sure your local store has something similar. 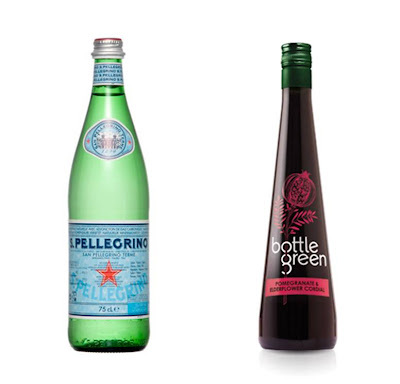 Simply pour about 1/4 inch of cordial in the bottom of a tall glass, and fill it to the brim with San Pellegrino.